Deep Cleaned, Sealed and Looking Brand New! Regular cleaning or janitorial services can only accomplish so much, when it comes to tile and grout. Our specialty is deep-cleaning and restoring residential and commercial tile and grout floors and surfaces. The professional technicians at Fabra-Cleen use only the best cleaning solutions and are thoroughly trained in using state-of-the-art cleaning technologies to extract the dirt and grime from deep within the porous surfaces of the grout. 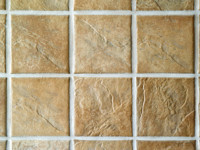 Protect the dramatically clean appearance of your tile and grout with our high-quality sealing and color sealing services. We serve the New York Tri State area from Manhattan to Montauk, the Bergen, Union, and Essex areas in New Jersey, and Fairfield County in Connecticut.